There was a time, many moons ago, when I belonged to a blogging group called Multiply which no longer exists. We had a professional photographer and I belonged to his group. He would encourage us to experiment. Photoshop was on my computer, but one of the original versions, nothing ultra special, and I produced this combination of an alpaca and an Amazon parrot. I don’t think it ever flew, only on my computer screen. Our local high school gave a concert with their band and I took a few photos. Another victim of my photoshop games. 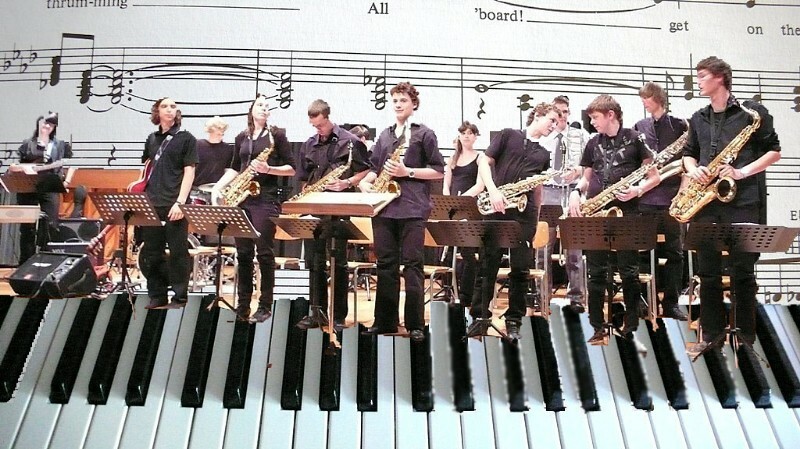 I planted the band on the piano keyboard of my son’s electric piano and gave them some music notes as a background. Just some fun photography. I can’t wait to do things like this! They are great! I love the keyboard one. I hope I can do something that good one day. Those are REALLY well done! Especially all the people on the keyboard. Very cool. I used to play a lot with photoshop, but no longer have the Programme. It was becoming bigger and better in the newer versions and more expensive to buy.